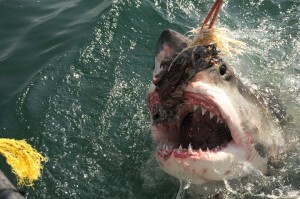 Nicole Hamrick spent January collecting data about the population of Great White Sharks near Mossel Bay, South Africa. While Minnesotans were shivering through the middle of winter this January, Senior biology major Nicole Hamrick ’12 was researching the Great White Shark in the radiant green ocean near Mossel Bay, South Africa. Having ventured out to sea many times with her family, Hamrick had an interest in the ocean. She learned the skills needed to conduct zoological research at Gustavus, and was able to put this knowledge to use with Oceans Research, a marine research group whose work has been featured in many places, including the Discovery Channel’s Shark Week shows. Hamrick was one of twelve undergraduate students from the United States, Australia, Bermuda, Canada, and several European countries who was ultimately selected to take part in an internship studying the Great White Shark. 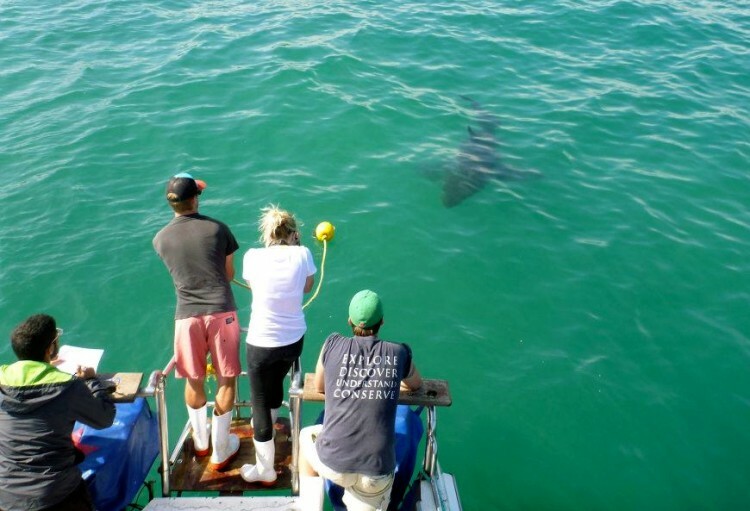 Hamrick and her colleagues tried to attract sharks to their boat so they could identify the number of Great White Sharks in Mossel Bay. The group of students worked with professional researchers to estimate the population of Great White Sharks in Mossel Bay with photo identification techniques. Hamrick went out to sea with a group of other students each morning and afternoon to “chum for sharks,” Hamrick said. Essentially, the group tried to attract sharks to their boat so they could take pictures and diagram unique features. “We would take sardines and put them in the water and it creates an oil slick. When the sharks come across the sardines, they pick up on that since they have really intense olfactory senses,” Hamrick said. With a spotter perched high above the boat deck to warn everyone when a shark was coming, everyone would be ready to carry out their respective research tasks as the large creatures, up to four meters long, swam near. “Sharks would follow the oil back to the boat, which is where we were and then we would have bait, like a tuna,” Hamrick said. The group did not intend to feed the sharks, however. A “bait roper” would ensure that the tuna bait was pulled away before a shark could nab it. Once the bait was pulled away, some sharks tried hard to find it. “Once the sharks got to the boat, they could stay for five minutes to two hours, depending on how aggressive they were. Their personalities were vastly different. There would be some that would just swim and not pay attention to the bait at all, but they were obviously interested because they stuck around. Then, there would be one that came in without hesitation and went straight for the bait. You had to be ready right away,” Hamrick said. 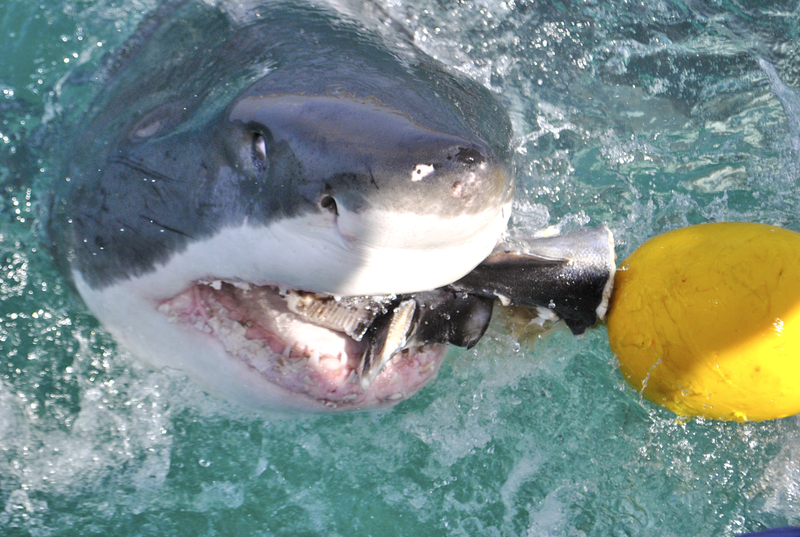 While the research team tried to remove the bait before it got bit, this shark managed to snag a snack. While the sharks were around the boat, the group worked hard to collect some details about them. “We wanted to get a picture of their dorsal fin. A shark’s dorsal fin is like a person’s fingerprint. They’re all vastly different. When the dorsal fin is out of the water, someone with a camera would take a picture of it,” Hamrick said. Another person kept track of physical features on each shark. “If it had a scar on its face, they would draw that into the picture. We had data sheets with the left side and the right side,” Hamrick said. Gathering the data at sea was just the first step. The group was able to make sense of the data and discover trends on the shore. “When you get back to the lab, we would put them all in the computer and organize them by shark. It’s interesting to call that up from month to month or year to year and see the patterns, because we have different locations that are spread throughout the bay,” Hamrick said. Hamrick was able to get involved in the research process right away. “The first job I had was camera. They kind of just throw you in,” Hamrick said. During her month-long internship, she had the opportunity to work in each role. Researching sharks in their natural habitat gave Hamrick the ability to see their true form and grace from up to thirty meters away. “It was so natural. It’s so effortless. They’re just there,” Hamrick said. 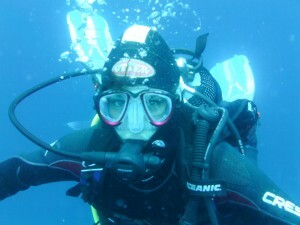 Hamrick was able to scuba dive during her trip to South Africa. When Hamrick started college at Gustavus, she had no idea that she would have the opportunity to conduct research on sharks, or even that she would be a biology major. “I came here thinking I was going to be a business major, and a year into it I changed my mind. I was too scared to do it at the beginning. Now I have done all of these amazing things. I feel I have so much to choose from,” Hamrick said. After she decided to major in biology, Hamrick developed broadly applicable research skills, which were helpful in her marine internship. “For many of the classes I have taken here, we have had to do independent research projects. I definitely think my doing research here helped a lot. I understood the importance of data collection and how structured it has to be,” Hamrick said. In addition to learning essential research skills, Hamrick choose to take courses at Gustavus and work on projects that related to the ocean research she did. Things she learned in Vertebrate Zoology Seal Island, an island near where she was researching, was especially helpful. At a weekend game drive, Hamrick had the opportunity to hold a baby cheetah. “When you drive by Seal Island, the seals would all be on their backs with their flippers in the air. Everyone was wondering why they did this, and I knew. It’s because they have a cross-current the way their blood runs, so when they put it in the air and it gets warm the blood that is traveling past heats up, so it heats up the rest of their body.,” Hamrick said. When Hamrick knew she was going to South Africa, she was even able to tailor a class project to her interest in sharks. “I actually used some of Ocean Research’s papers for a paper I wrote in EEB (Evolution, Ecology and Behavior) about sharks,” Hamrick said. Hamrick is confident that she got a great education in marine biology, even though there is not a marine biology specific program at Gustavus. “I feel like I got just as much out of it as they did in her whole specified three or four years,” Hamrick said. At the same time, because Hamrick took a broad selection of courses, and the fact that she has had the opportunity to intern in a hospital setting, she could go into the medical field after graduation if she wants to. “I feel that with the courses I chose to take here, I could go either direction. I could go medical or I could go invertebrate, or anything,” Hamrick said. While Hamrick did marine biology work during her weeks in South Africa, she had the opportunity to explore the country on the weekends. Hamrick experienced the world's tallest sky dive, at 216 meters. 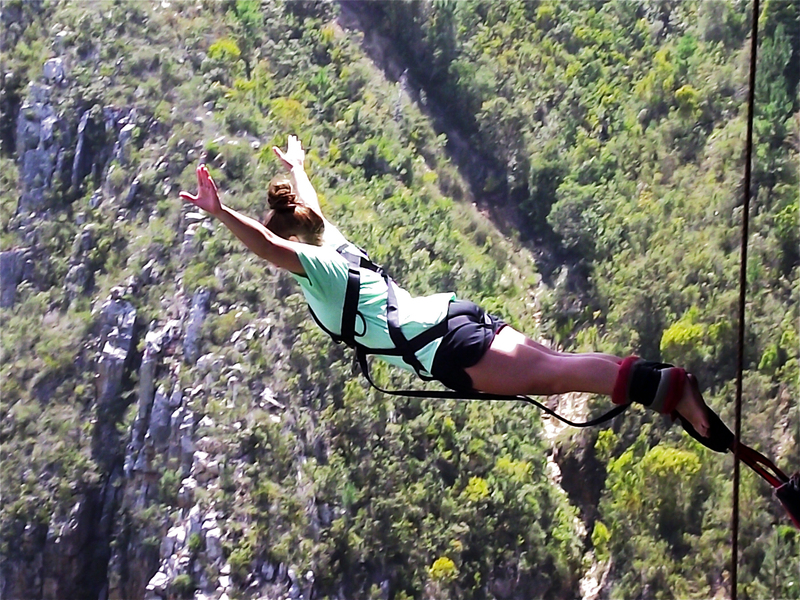 “One weekend we went bungee jumping off the world’s tallest bungee jump. I have an intense fear of heights. Everyone was so excited, and I was terrified. I ended up going last. It was kind of a competitive thing. 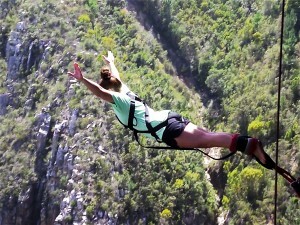 The free fall was the scariest part,” Hamrick said. Another weekend, Hamrick traveled with her research colleagues to a game drive, where they were able to watch large African animals being fed. 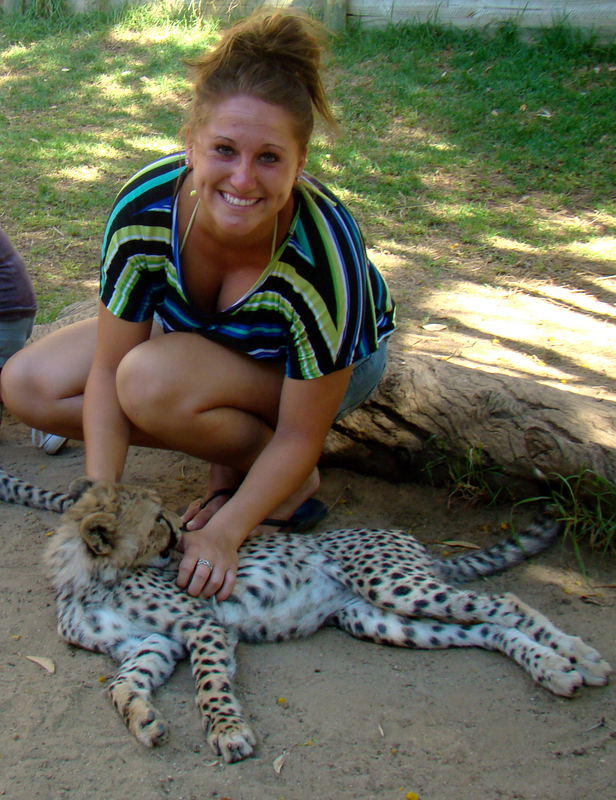 “I got to hold a baby cheetah. We would drive down the road and there would be a zebra on the side,” Hamrick said. Overall, Hamrick had a great experience in South Africa.